Because I don\'t speak Japanese, I rely on the altavista.babelfish.com translation tool--which is anything but reliable. This story began with Gemaga\'s Live Blog on Nintendo of Japan\'s media briefing, the part we\'re interested in is below. Whenever the translator doesn\'t recognize a word (usually it\'s a proper name) it inserts \"??? ?\" instead of the correct word. BUT they\'re actually talking about Super Smash Bros. Brawl because \"Brawl\" will be released January 24th 2008 in Japan. Up-to-date image of 14:24 スマブラ releases! It is net correspondence, but not only opposition joint ownership big theme. 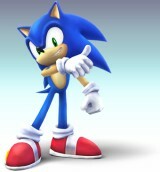 And, sonic participates to スマブラ! Furthermore it changes to supersonic! However, sale day in modification....... It is 2008 January 24th. It has been confirmed here as well as at the Dojo, SSBB\'s official page, where you can see pics (also below) and watch the \"Challenger Approaching\" video. Very, very cool. I can\'t wait to live all my Mario vs. Sonic fantasies when Super Smash Bros. Brawl hits US stores December 3rd.